This past weekend, Café Edison, the Theater District diner that will soon close, was filled with people crowding the front vestibule to pick up stickers in support of the place. Near a window, a cameraman followed three costumed sailors from On the Town to a center table, where they ate cabbage soup and sipped ice water from large red tumblers. An elderly woman, bundled up against the cold, was making her way to the exit with a bag of leftovers. 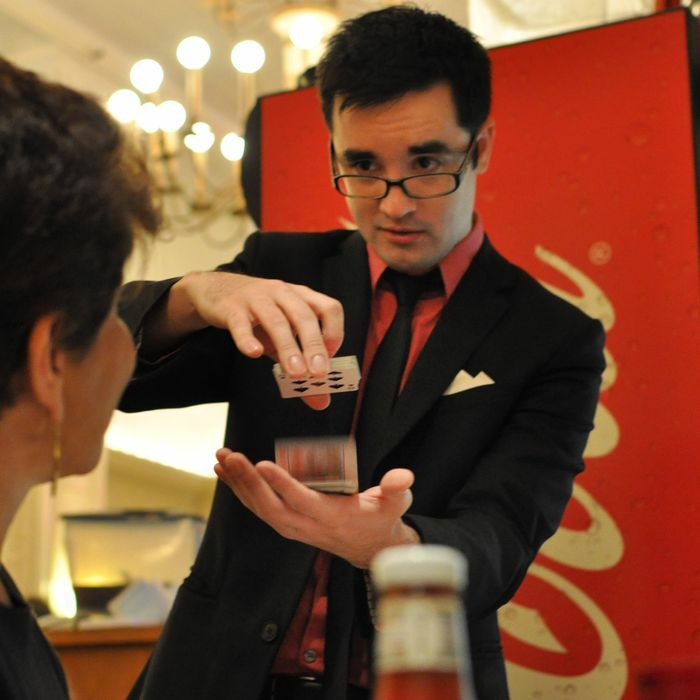 In the back, however, Patrick Davis was busy reading customers’ minds. He shuffled a deck of cards. “When, exactly, was the last time you had your mind read?” he asked a table of three ladies. 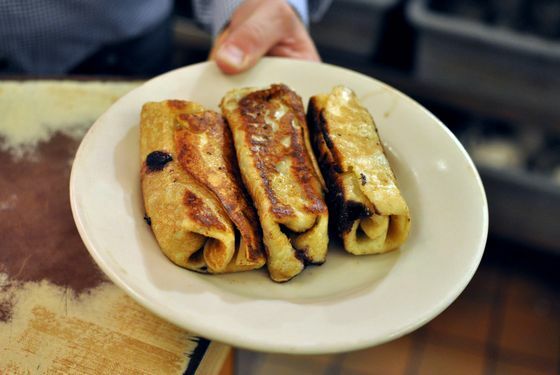 They were regulars and ordered blintzes, sour cream on the side. “Last night,” one woman quipped back. She picked a card, any card, anyhow, memorized it, and put it back in the deck. Davis announced he would name it just by visualizing it in her eyes. “I’m ready,” she said, staring deeply right back into his. The women laughed. 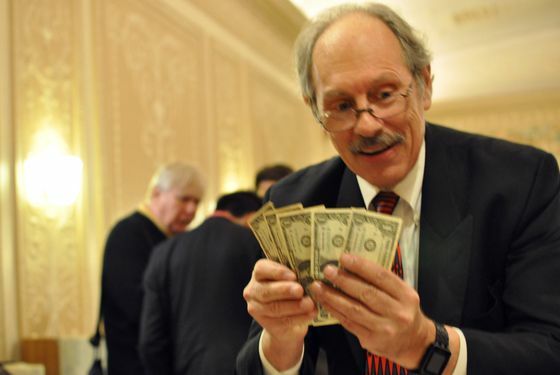 Davis angled his glasses down his nose and fired through a list of card parameters: “Red, red, black, spade, club, heart, heart, diamond, red, red, black,” he said, going on, before pinpointing the correct card and moving on to the booths. Even the surrounding tables clapped. According to Tom Klem, historian and Society of American Magicians board member, regulars once included Dai Vernon, whose sleight of hand is an enduring legend, and John Scarne, who worked playing cards like few ever have or ever will. David Copperfield, too, who at the time was better known as “Davino the Boy Magician” to the older crowd, that precocious kid who came on public transportation from Jersey. Alan “Ace” Greenberg, the late, former head of Bear Stearns and all-around colossus of banking, was a frequent attendee. On this particular Saturday, six Table members had made a special weekend trip at the behest of manager Conrad Strohl, who has run the Edison since 2009, when the original owner, and Strohl’s father-in-law, Harry Edelstein, passed away. The magicians didn’t bring top hats or doves, and only one wand made a dining-room appearance (though who knows how many others were hidden just in case they were needed). 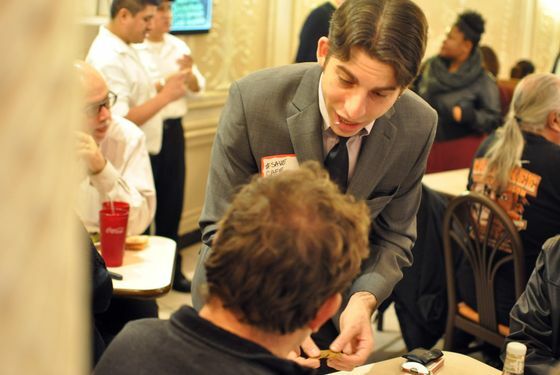 There was no brash Criss Angel–style eyeliner, either, so it wasn’t always easy to pick the affable sleight-of-hand men out from the crowd of diners happily clanging forks on plates and sipping matzo ball soup. At one table, two young women ate scrambled eggs with French fries and ketchup, but sat back and beamed when Richard Bossong wandered over. “I don’t want to interrupt you if you’re eating,” he said, and started to walk away. “No, no, we want to see something,” one said, shaking salt onto her fries. Bossong looked like a college professor in tweed, though he sometimes goes by Nollaig the Wizard. (His business card is stamped with the words magic, stories, and mystery.) Just before the waiter delivered a second course of pastrami to the table, Bossong asked for a woman’s palm, into which he dropped one red sponge ball and closed her fingers around it. He kept one for himself, which promptly disappeared. The woman uncurled her fingers to reveal she had both.